Clearly you’ve heard- acrylic furniture is all the rage! And where better to show off the style than in a chic living room. 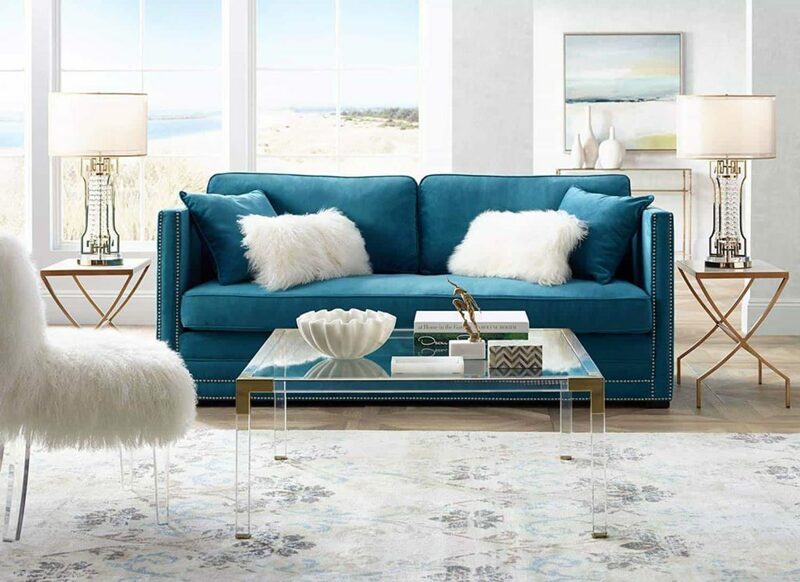 In this guide, we cover 5 of the most beautiful acrylic coffee tables you can get your hands on! But first- why is an acrylic coffee table a great idea? Having a clear coffee table is not only stylish, it can make your space look even bigger! It’s a fun visual trick that helps your sitting area feel more open and airy. What’s not to love about that? 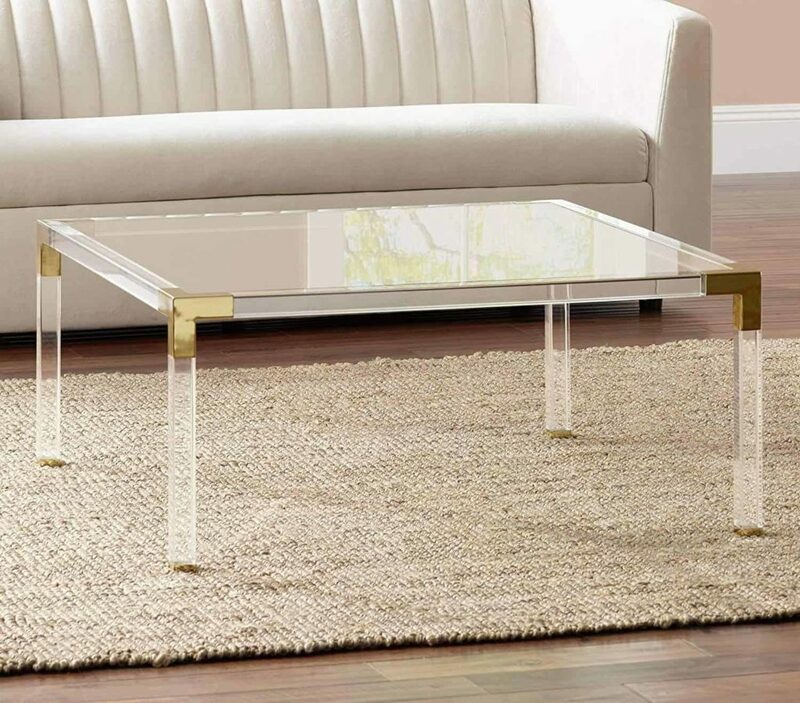 The Hanna acrylic coffee table has all the beauty of a clear table, with a little something shiny added. The gold finish on the corner and feet of this table give it an extra layer of luxe, that will make your living room shine. The table has a gorgeous acrylic frame, and the top is made from a tempered glass. This makes the tabletop more durable, and resistant to scratches compared to others with acrylic tops. Measures 40″ wide x 40″ deep x 17″ high. Clear tempered glass top with clear cast acrylic frame. Gold finish corner and feet hardware. The Tangkula acrylic coffee table is one of the most unique shaped tables you’ll ever see! The double sleeve legs makes it super sturdy, and they can even double as sleeves for magazines! 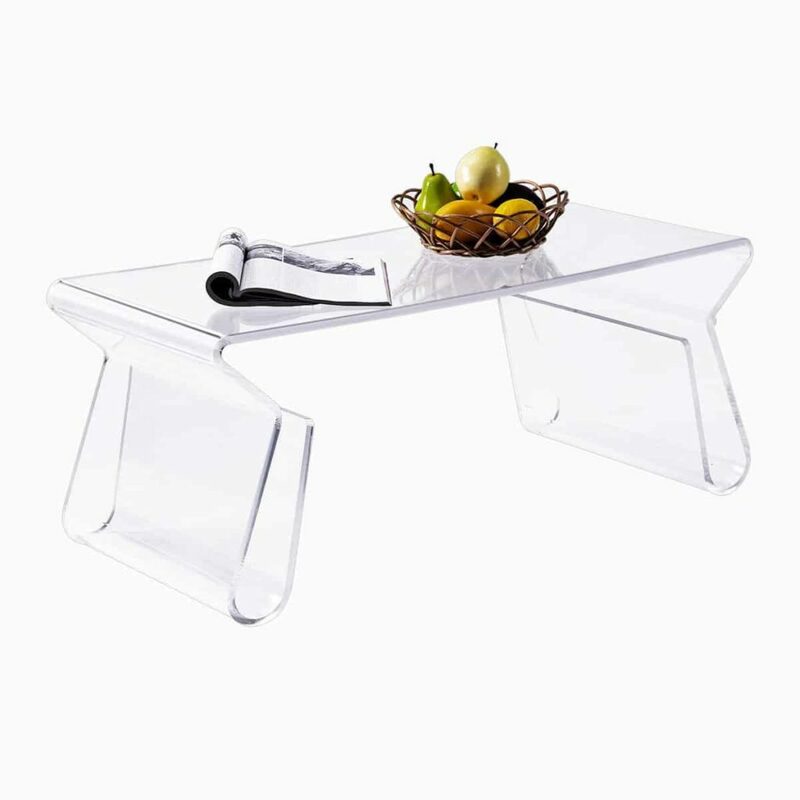 The table is made from a seamless eco-friendly and nontoxic acrylic. It’s also weather resistant making it perfect for using outside- patio season anyone? Measures 38.5″L x 17″W x 16″H. 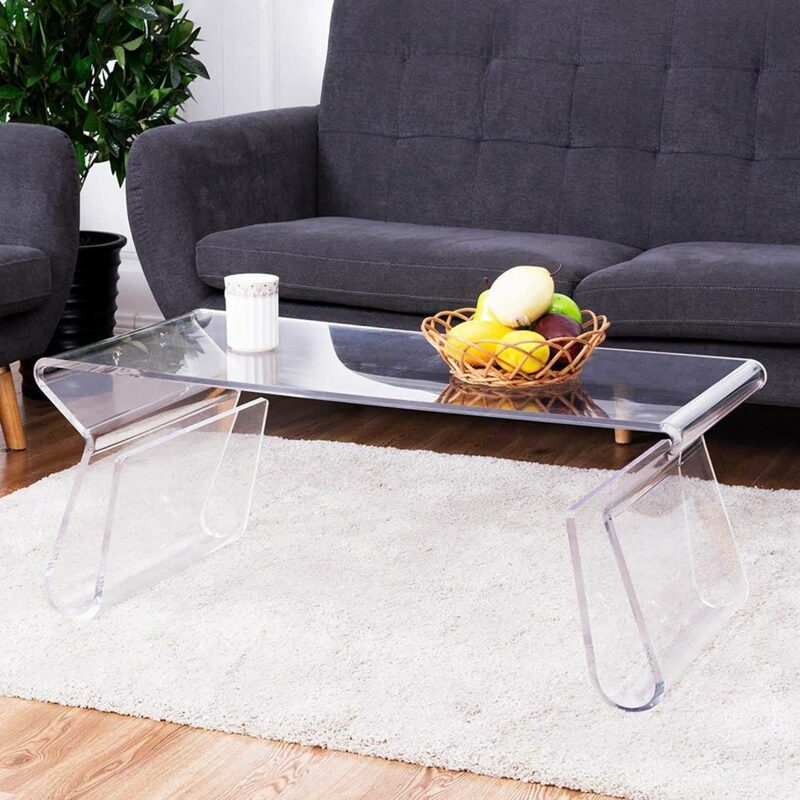 One of the most affordable acrylic coffee tables you can get, is actually a set! 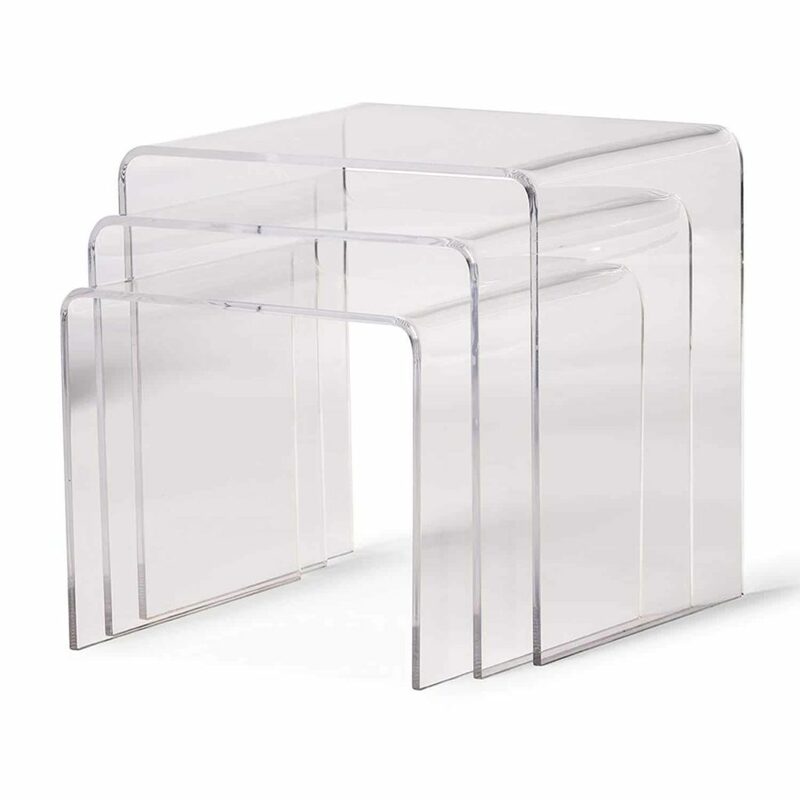 These nesting tables give you the chic clear style, with a low profile waterfall edge. 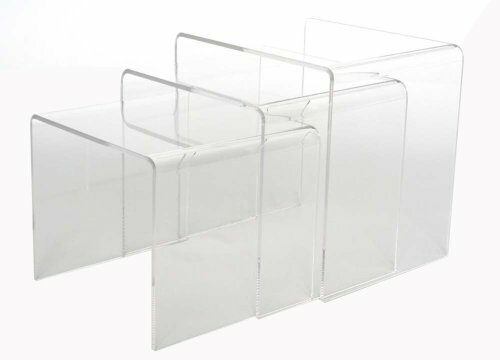 These tables are easily stackable, and made from a scratch-proof acrylic. They’re a great choice for a small living room where you need the flexibility of easy to move pieces. Measurements- Small table: 13.75″w x 13″d x 12″h, Medium table: 15″w x 13″d x 14″h, Large table: 16″w x 13″d x 16″h. Low profile with waterfall edge. 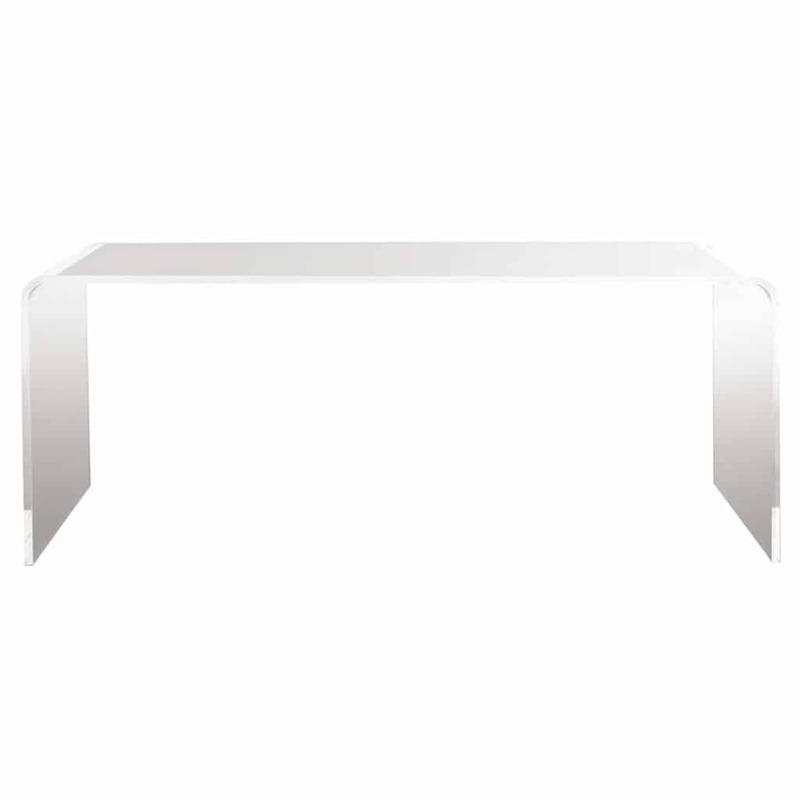 The Safavieh Atka table is exactly what comes to mind when you think of a clear coffee table. It’s sleek, stylish, and adds a modern touch to any room. It’s designed with a seamless clear finish, made from a sturdy acrylic. The waterfall edge makes it look like it’s floating over your living room, and best of all- it’s affordably priced! Made from a sturdy acrylic. Safavieh does it again with modern glam style! 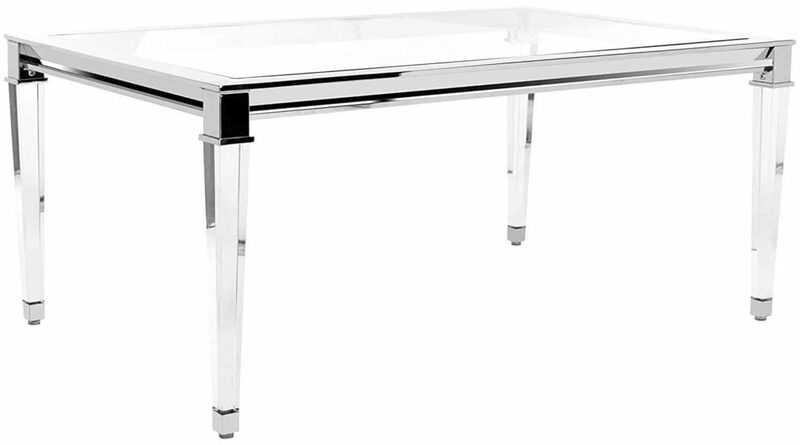 The Charleston acrylic table has a gorgeous stainless steel silver finish, which will instantly make your room look polished. Like the Hanna table mentioned earlier, this one too has an acrylic base, and a glass top. The beveled table legs are sturdy and stylish, giving it a heirloom look. Colorful coffee table books are a great way to add layers of interest. Use a small tray on top to hold useful items like remote controls. Invest in an acryling cleaning kit to keep smudges and scratches away. Add color under your clear table with a vibrant area rug. An organic object like a flowers or piece of coral will help balance the space. We hoped you enjoyed this round up of beautiful acrylic coffee tables. Are you planning to try out the acrylic trend in your home? If so, let us know in the comments below! And if you found this article helpful, click share on Pinterest!